GamesCom, the largest game-related convention in Europe, just wrapped up its third annual showing. Held in Cologne, Germany, the event draws thousands of gamers, journalists, and industry insiders to appreciate and exhibit the latest industry happenings. It also draws seasoned gamers, the best of the best, to participate in weekend long tournaments. Blizzard, Riot, Valve, and others held championship games with some of the best players around, offering hefty awards to the victors. Valve went so far as to offer a one million dollar prize to the winners of their Defense of the Ancients 2 tournament. Riot upped the stakes by announcing a five million dollar purse to League of Legends Season 2 champions. While I will certainly never claim such a reward for myself, the act of watching tournament level play alone enhances my own gaming experiences. Although I caught a few viewings of Starcraft 2 and DOTA 2, I paid most attention to the League of Legends tournament. If you have never watched tournament level play of a game with which you are familiar, I urge you to visit youtube fix this promptly. Eight LoL teams of five faced off over three days, changing their team’s composition and strategies during each match to outsmart and counter their opposition. The skills exhibited by these teams are mind-boggling. Individuals skirmishes occur with great intensity and precision, with pro-players managing their resources expertly while also demonstrating a supreme sense of spatial awareness. Team fights occur with precision, with players taking hits and getting out of combat as necessary, often before coming back and unleashing hell. Watch one match and it becomes perfectly clear why these players rank among the best in the world. The difference between how I play LoL and how the pros play LoL is astronomical, and recognizing the difference dramatically changes how I view my own play. Watching someone pull off a near miracle with ease is humbling. I have trouble escaping ambushes all the time, yet I’ve seen pros face a group of five, take out two enemies, and then flash through the level geometry like a wizard, with just enough health to survive. At other times, I’ve watched a team chase down an enemy like a pack of hyenas on the hunt. In comparison, my own actions must look like the spasms of a child. As a result, I have started to constantly question my behavior. I now play safer in general, while taking greater risks in certain circumstances. If a pro can dive an enemy player low on health to snag a kill and get away easily, then maybe I can too. My shame is abated whenever the minor deities at work falter. During one match, the knowledgeable shoutcasters called out a player for walking into bushes where the entire enemy team were waiting. It was clear, even to me, that “face-checking the bushes” was not a smart move. Of course I do this all the time, but this behavior is less risky when you are not playing against other championship opponents. Watching high level play of any game, besides likely making you a better player, changes how you approach your own matches. Although I have not started playing more competitively, I have started paying greater attention to my own play styles, mistakes, and victories. If I am lucky and just skilled enough, a transcendent moment occurs where I do the impossible, leap into battle, play my cards just right, and seize an amazing victory. On occasion, with high level play in mind, I can feel like a pro. Want to watch a match? 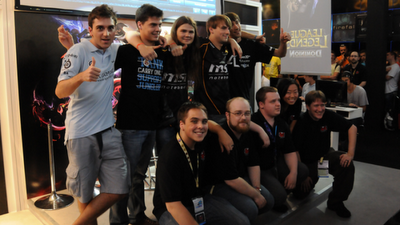 You can view the recent GamesCom recaps here. Don't let HotShotGG pick Nidalee! I just got into League recently, and I was glued to the GamesCom tournament footage. It's a fascinating game to watch, on both a strategic and tactical level. I loved what TSM was doing with the Wriggle's Lanterns/early Baron. Yes! (On all accounts). The Wiggle's Lanterns thing is so interesting because I've been in matches where players have been ridiculed for buying the item. When playing with non-high-level players, high-level strategies can seem bizarre. Then again, an early Baron could mean a clinched match.